VIP Delegation of POLYMER BAZAAR at IRAN PLAST 2017. It gives us an immense pleasure to invite your registration for VIP delegation for upcoming Iran Plas 2018 ,Tehran scheduled from 24 - 27 th September 18 at Iran. 🔺 Scheme: Complimentary stay & ground arrangements are as under. 2) Three Nights accommodation in 5 Star hotel. 3) Airport to Hotel & return to Airport transfer. 6) Supporting visitors at the exhibition ground. ➡ Want to Import Polymers from Iran ? Here is a full data of Iran Petrochemicals Production Companies. 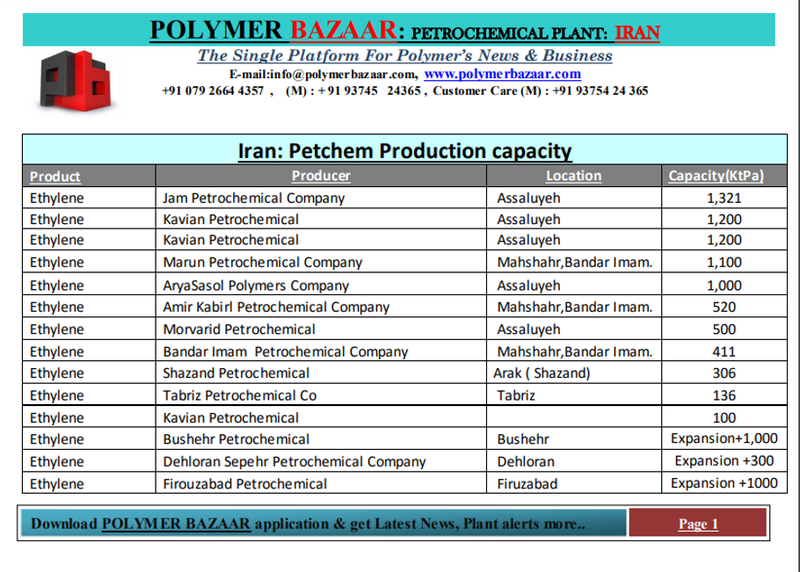 In order to assist PolymerBazaar Subscribers to source their required Polymers /Chemicals / Products from Iran,a Sp. Report is published. 🔹 Report is self explanatory with data in below order.